Apple this week filed a new lawsuit in the U.S. against rival Samsung, with the latest complaint related to autocorrection of spelling, as well as unlocking a device from its touchscreen. The latest suit, filed on Wednesday, seeks a preliminary injunction against Samsung products Apple believes are infringing upon its own patented inventions. Specific details of the case, which emanates from U.S. District Court in San Jose, were not made available for viewing online after they were entered into the court. U.S. Patent No. 8,074,172 - "Method, System, and Graphical User Interface for Providing Word Recommendations"
U.S. Patent No. 5,946,647 - "System and Method for Performing an Action on a Structure in Computer-Generated Data"
U.S. Patent No. 8,046,721 - "Unlocking a Device by Performing Gestures on an Unlock Image"
U.S. Patent No. 8,086,604 - "Universal Interface for Retrieval of Information in a Computer System"
Named as the three defendants in the suit are Samsung Electronics Co., Ltd., of Korea, Samsung Electronics America, Inc., based out of New York, and Samsung Telecommunications America, LLC., a Delaware company. The patent infringement suit has been assigned to Judge Lucy H. Koh. Exactly what products are being targeted in Apple's latest filing is not known, as the complaint itself has not been made public. Previous patent lawsuits filed by Apple have taken aim at Samsung's Galaxy line of smartphones and tablets, which Apple believes have illegally copied the look and feel of the iPhone and iPad. Last month, Apple filed another suit in Germany against Samsung, accusing the device maker of infringing upon its patented "slide-to-unlock" invention. That's just one of many legal battles that are ongoing between the two rivals. 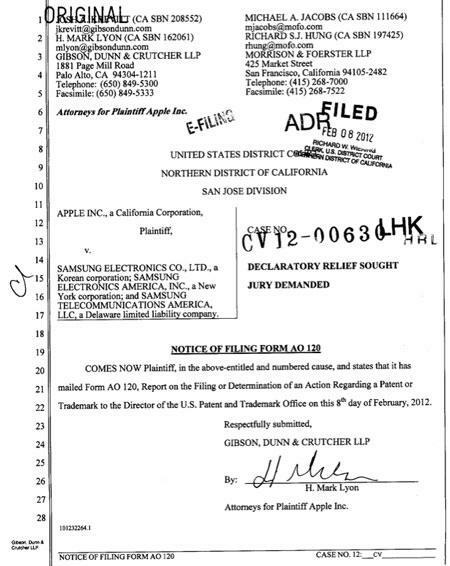 Lawsuits between Samsung and Apple first began last April when Apple filed the first complaint. They have since continued to grow, and now span over 10 countries across four continents.